LUQMAN BROWN's life started in the theater. Son to noted playwright CARLYLE BROWN, his first memories were of the plays his father and friends put on in their loft in Dumbo Brooklyn, with their gorilla theater company called The Laughing Mirror. It was the catalyst and inspiration for much of his early creative development. However, in an effort to create his on path, he dove head-first into music. Now LUQMAN is a well-known bandleader with over twenty years of experience in on-stage performance and studio recording—prolific and proficient as a recording engineer, producer and composer. He's written and produced music for bands and solo performers, as well as for TV, radio and film. As a SOUND DESIGNER, he has 6 years experience in a variety of audio production technologies including: mixing consoles, microphones and microphone preamplifiers, signal processors, and stereo multi-track digital and analog audio recorders editors and mixers. Specialty disciplines include: studio session recording, pre- and post-production recording and mixing and some field recording, all of which require advanced knowledge around a variety of software and hardware applications. As a PRODUCER, he's worked with 24-7 SPYZ, BURNT SUGAR, COREY GLOVER of LIVING COLOR, and many more. Whether it's composing a new song, helping you with a melody, or getting you that right mix, LUQMAN has you covered from recording to mastering. Owner of his own recording studio, BUDDHABUG RECORDS STUDIO in Harlem NYC, and rehearsal studio, SPACE STATION 8, in Brooklyn NYC. He has the facilities to accommodate most jobs. 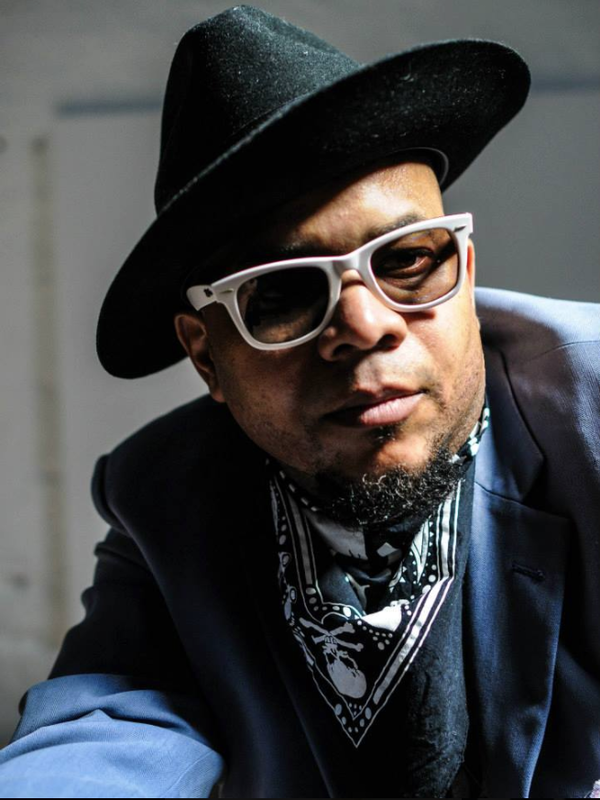 As a PERFORMER, LUQMAN's first endeavor, FUNKFACE, has played and toured the world professionally for more than 20 years. Make no mistake about it, this 5-piece unit has been around the block, in your mom's house, up the river and back down again. Lead singer Luqman‘s vocal assault stirs the swarm while the rhythm section staggers the senses and the guitars ignite the frenzy. This band's sound has remnants of the punk age—hard rock with a little twist of hip hop, funk-soul and ska. The ultimate fusion, total groove rock which many have referred to as Soul Core. FunkFace was called "the hardest hitting band in the world" in Fader Magazine and featured in the documentary Afro Punk, as leaders in the black rock scene. Currently LUQMAN has released a pair of solo records under the moniker DOPE SAGITTARIUS. This new band is an electro, hip hop, punk rock extravaganza. This 5-piece unit of bass, drums, & two guitars is like one mega DJ mixing and blending hot, modern dance floor beats. Utilizing live instruments to create amazing grim, dub step, drum & bass, breakbeats, electro-funk, punk, soul, blues and so much more. It's DJ's choice. As M.C. WHISTLER, LUQMAN's lyrical flow switches styles so fast that you will do a double take, looking for the DJ. DOPE SAGITTARIUS NEW ALBUM "SACRED PLACE" will be released in the Summer of 2017. If that wasn't enough, Luqman is a big band leader under the name of MACKIE RIVERSIDE. MACKIE RIVERSIDE & THE STREET PUSHERS sops up the funky grooves and serves 'em up with a 10-piece of baaad mo-fos slanging '60s, '70s, '80s and '90s Stax, Soul, Funk, Disco and Blues. A super-hot dance band full up on rhythm, they have all the toys—a sizzling tight rhythm section and a funky horn section. Of course, the whole thing gets amplified by the mega-watt wild man/impresario/task-master/boogie-blaster/cherry-on-top himself...MR MACKIE RIVERSIDE. MR&TSP is available for weddings, corporate and private parties, or special events along the Eastern seaboard. Large or small, no event is too far. Competitive pricing and professionalism makes MACKIE RIVERSIDE your best bet for a good time! BR'ER RABBIT in "Br'er Rabbit The Opera: A Funky Meditation On Gentrification (Work-in-Progress)" @ BRiC Arts (Dec 15, 2014–Jan 23, 2015). This show tackled the modern dilemma of gentrification through the lens of legendary Black folklore hero, Br'er Rabbit, and his birthplace, the Briar Patch. It merged music, performance art, and community engagement to create a final piece that engaged adults of all cultures in reflecting on the life-lessons our respective Briar Patches have taught us. HEIMVEY in "Family Album" @ Oregon Shakespeare Festival (March 13th - August 31st, 2014). Book and lyrics by Stew, Music by Stew and Heidi Rodewald. In short, Singer/songwriter Heimvey and his band had been on the road for years, living their middle-aged version of the rock 'n' roll dream. But when they stopped to visit old friends—a former bandmate, along with an ex-girlfriend who has created a new kind of life that blends art and family—they all begin to question the choices they made. This rollicking, irreverent musical by Stew and Heidi Rodewald, the team behind the Tony Award–winning hit "Passing Strange," took wicked aim at the tradeoffs and dilemmas facing anyone trying reconcile the dreams of youth with the practical realities of grown-up life. LUQMAN BROWN works for BUDDHABUG RECORDS; an enhanced-record label based in Harlem, New York with prolific output in the fields of sound design, audio production and event production. Since forming in 2007, LUQMAN (through BUDDHABUG) has lent his unique style to sound engineering, audio technology editing, mixing for film, video, animation, television, radio, interactive media, live venue performance, and studio recording.